Before I get into the next tool, I want to say that I am pretty straight forward and of course my opinions are my own. I am not paid or endorsed by any company (and if I was it would start with that information right up front). So, when I share, I am sharing from my perspective... and what I found to be true or not. I also think that you do not need the latest and greatest of everything to be creative or create. We do need to eat, right? But sometimes we need to consider changing our tools especially if it makes creating and playing easier or more comfortable or in some cases, even possible! So with that said, on with the show. I have recently discovered (for myself) some new scissors!!! I have been a dyed in the wool Ginger and Fiskars user. Why? Well I have several pairs of Ginger scissors in 3 different sizes that I bought way back when, (in the latter half of the 80's) and I rarely every use them. I have a pair of 8 inch dressmaking shears, a pair of 5 inch scissors and a pair of embroidery scissors. I let a local sharpener sharpen them. Big MISTAKE!!! They are sharp, but the points are now too pointy so they catch on everything. I haven’t really missed any them... except on the 2 or 3 occasions I needed to actually cut out a pattern. I also have a bevy of Fiskars and Fiskar-like (colored handle) scissors. Many I inherited and several I purchased. I use them about as often as I use the Gingers these days. I have discovered some new ones. In April while at the Spring Paducah Show I picked up 2 new, to me, scissors. The first one is for cutting batting. I find them very useful when cutting batting from a roll at the longarm. 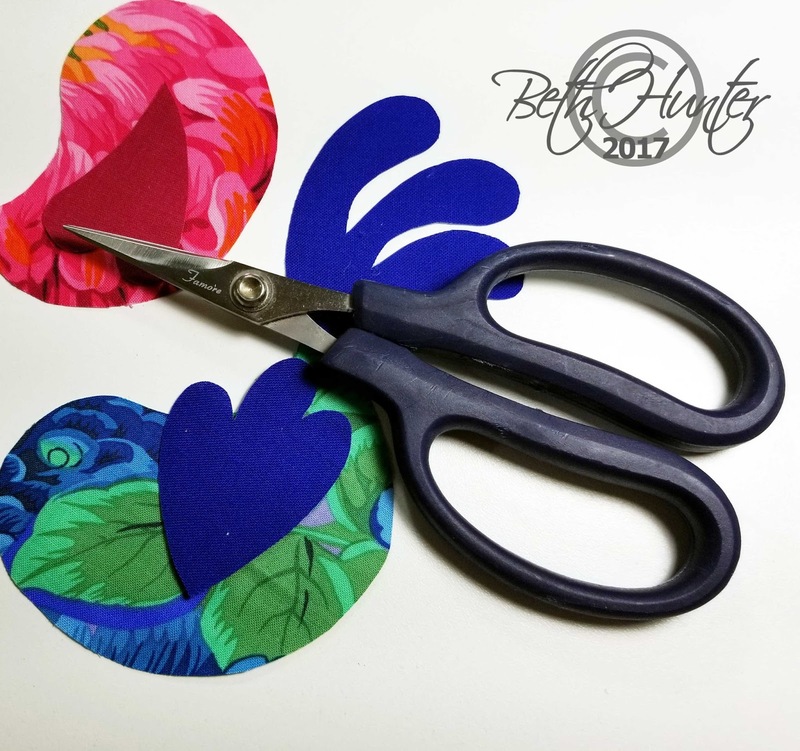 But don't let that fool you, they are great for cutting batting to size for smaller projects as well as regular fabric cutting scissors. So what is the advantage of these over say a pair of Fiskars (what I was using before). The Batting scissor has a blunted end so it does not grab or catch the batting as you advance you scissors to the next cut. And the blades are much longer so you are not advancing as often and that helps create a much smoother cut. The other pair I picked up are for hand cutting. I often find myself cutting many motifs and bits from fabric for applique and most times I find the traditional shaped scissors bother my hands when I am making lots of careful repetitious cuts. In many of my older model scissors the small openings for my fingers and/or thumb tend to cause discomfort and depressions in the skin from holding and cutting carefully. I found these large handle scissors that are not particular about which side is fingers or thumb and are very comfortable to use for hours at a time. The serrated blade really helps hold and cut at the fabric at the same time is a great help. I think it is a huge asset to be comfortable while creating!!! I was talked into one other cutting implement. A scalpel for the longarm. Long thin tool at the top in the next photograph. WOW! It really makes unstitching a breeze. Of course it is very sharp... and could cause some additional problems if you are not paying close attention. The longarm I have allows me to lift the roller the top is attached to, to get under the top above the batting. So I can do what is being called "skin the quilt", by breaking the stitches between the batting and the top. Goes really fast! At the 'new' Fall Paducah Show in September, I decided to check out one more cutting item. 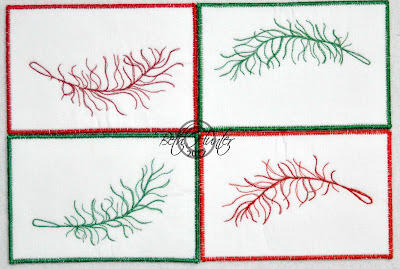 I have seen them used by many Machine Embroiderers and since I do so much thread... stuff I thought they might be handy for me too. And guess what, they are! Prior to these I was using a very sharp pointed pair of small Fiskars, (bottom left in the photograph above) and once or twice cut something unintentionally (not a good thing!). With these very sharp, but curved blades and again no holes to stick my fingers in, snipping my project free of the machine is a quick snip away. I also found them very useful at the longarm, when snipping threads, again the curved blade helps to keep from cutting the fabric, when snipping the threads. In addition they are extremely lightweight. So WHAT are these great scissors? Famore Brand- said Fa-mor-ray. You can find them at Famore.com. I Have A Notion™ Shop has one or two pair and I hope someday to carry the 4 pieces I have mentioned above, especially if there is interest. But if you think you might prefer ... another brand, say for instance Karen K Buckley... I have a couple of those in the shop too. I haven’t used them myself so I can’t tell you which is better. I don't know if I mentioned it or not, but Thread is my thing!!! It is how I learned so much about needles and the best one for the job. 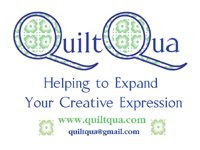 Well that is not exactly true, it was Free Motion Quilting that led me down that path, but much of what is true for the Quilting part is also true for the Free Motion 'Threadplay' part. So I thought that my next logical step would be to do some show and tell .... about the "Threadplay". Let me start with one of the most difficult Free Motion Threadplay options. Metallic thread. These are postcards, and came about so I could compare the difference/sameness of the Fil-Tec Glide to the Floriani Thread. I had never used the Floriani and if I have to sell it, then I guess I should know something about it. I have used the Glide in the longarm and recently used it for another project in the Janome domestic machine, which is where I did the postcards. I stitched these Free Motions with just the spine drawn. 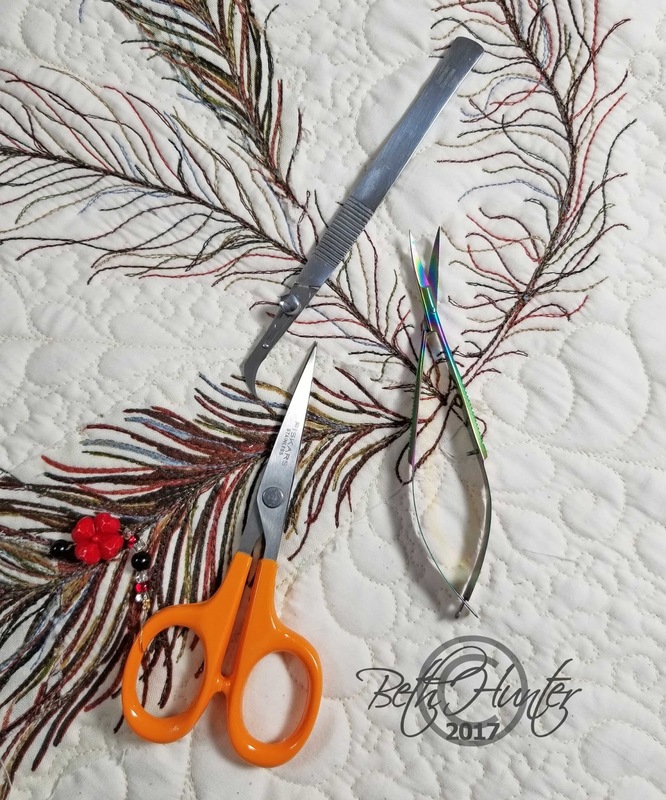 The feathers on the left are Floriani thread and the feathers on the right are Glide thread. 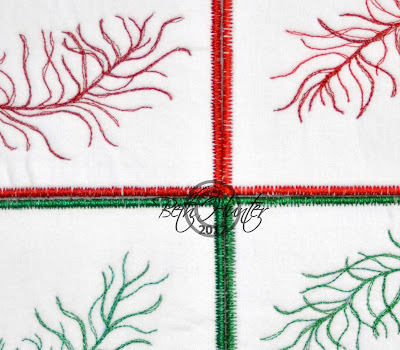 The threads appear to be very much alike and the only real difference is the slight variation in color, I picked Floriani threads that were a close match to the Glide threads, and chose red and green. There wasn't a problem with either thread and to further test things I also tested the Signature Metallic thread. Wow!!! You don't really see it in the pictures, but I went over some areas with the metallic. 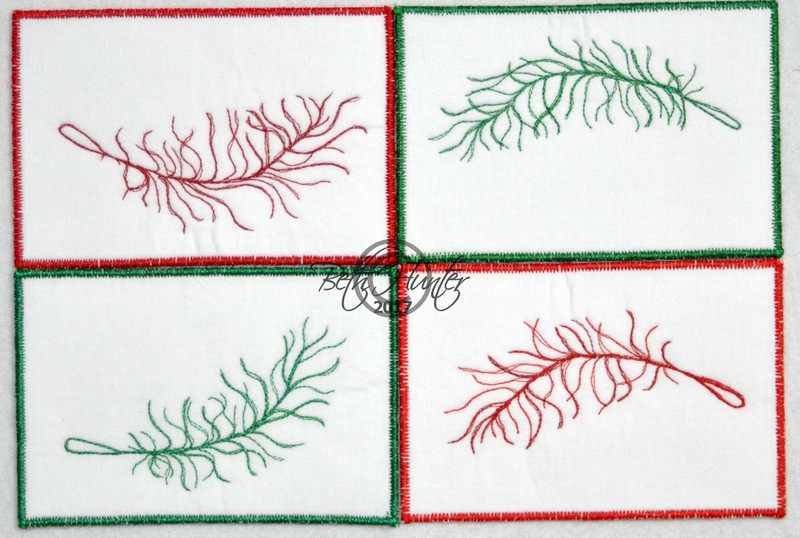 I stitched pretty quickly and the Signature Metallic stitched like a cotton, no breaks, no shredding and no kinking. Of course a large eye helped the thread move without breaking. The second is a detail photo, and it also is a little light on the metallic sparkle visibility. These were great fun to make, if you haven't ever made any postcards now is the time to try. Send one as a surprise to a friend or far away family member. I keep a stack on hand to mail... as needed. People just love to get them in the mail! So to sum it up Floriani thread seems to stitch up the same as any other Polyester thread that I have used. Next up is to test the Floriani for use on the Longarm. 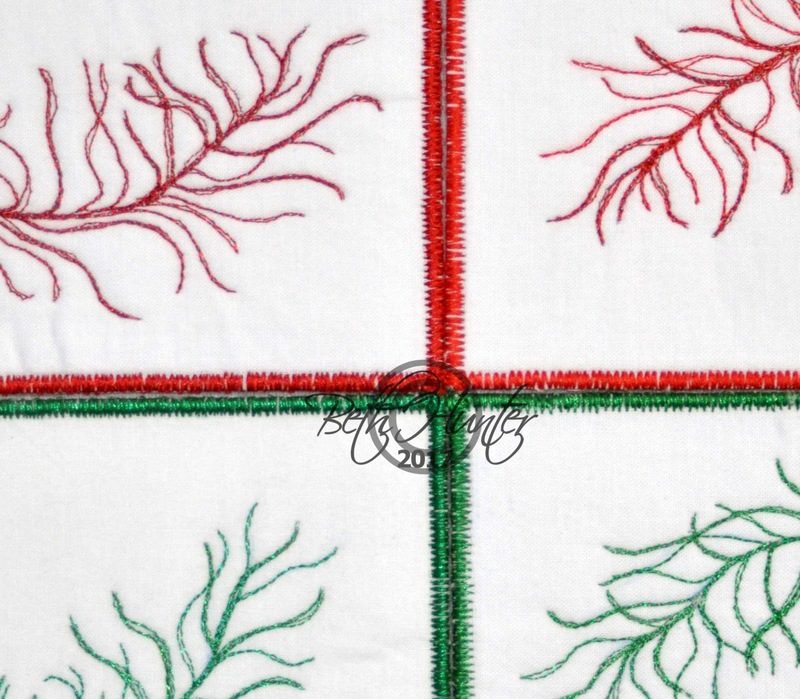 Have you ever received a textile postcard in the mail? Leave a comment. You might be the lucky one to receive a feather in the mail! I also seem to have many once in awhile obligations that make me shift back and forth.... almost weekly. This week is no different. 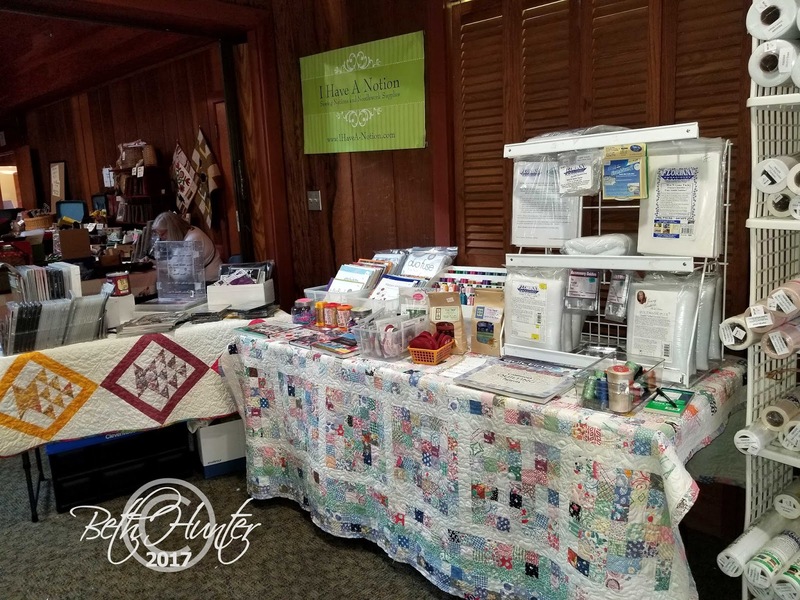 There is a mini retreat later this week (basically a one day sewing event) where you are fed. I am the organizer, so I have to come up with the plan and the food for the day. I plan to cook for the ladies... (the last 2 times we had a delicious sandwich and salad bar) so something different will be required this time!!! I was hoping the weather would cooperate so I could make soup and have it simmer on the stove all morning, but we are not yet that cool in Kentucky, so plan B will be implemented. Homemade Pizza. As you see by the last post... I was thinking about talking about some of the tools of the trade, (I don't have the regular Chrome needles yet, but I will, Please please please be patient... with me), especially some of the newer innovations that make our time spent creating so much more effective... Speaking of creating, I finally got back into my creative space.... the last couple of days. Usually when I have had to change gears.... and step away from the daily opportunity to make a mess, I mean create, I start by doing a bit of cleaning or reorganizing and then dive in. I cleared off the table of things I didn't need or generally has its own place in the Creative Space, and then I got busy. 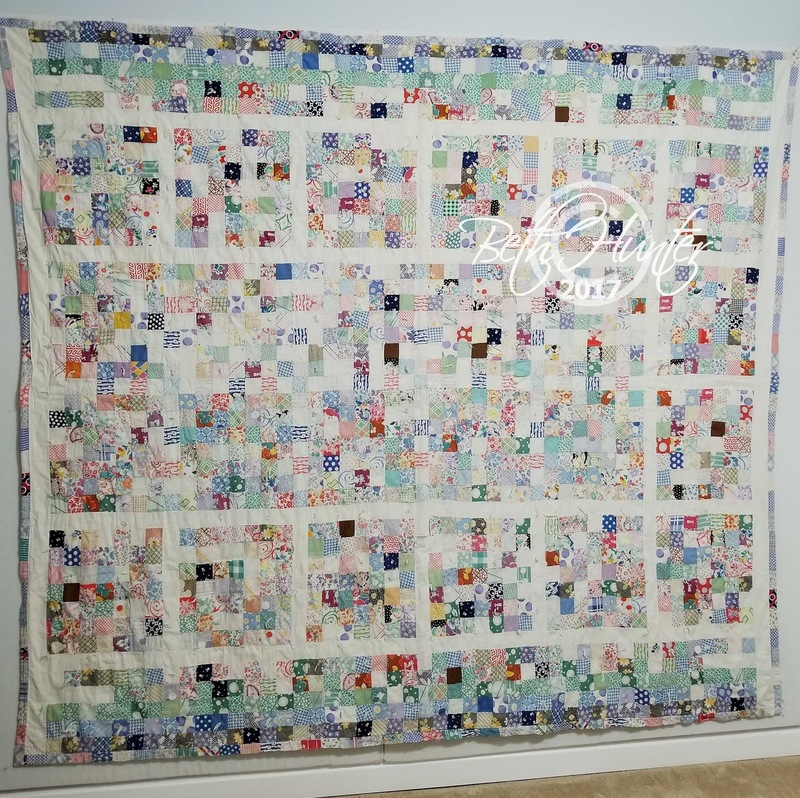 I had 2 baby quilt to get done. ONE is late!!! and the other still has a few months before it will be needed. 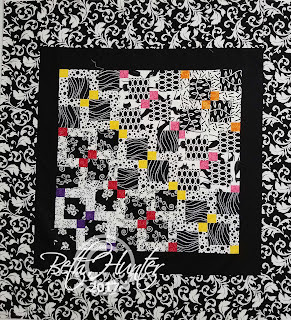 I got out the box of Baby Quilt Fabrics, it sounds like so much more, but it is just a plastic shoe box and only contains a few bright tone on tone prints and some scraps of black and white fabrics. 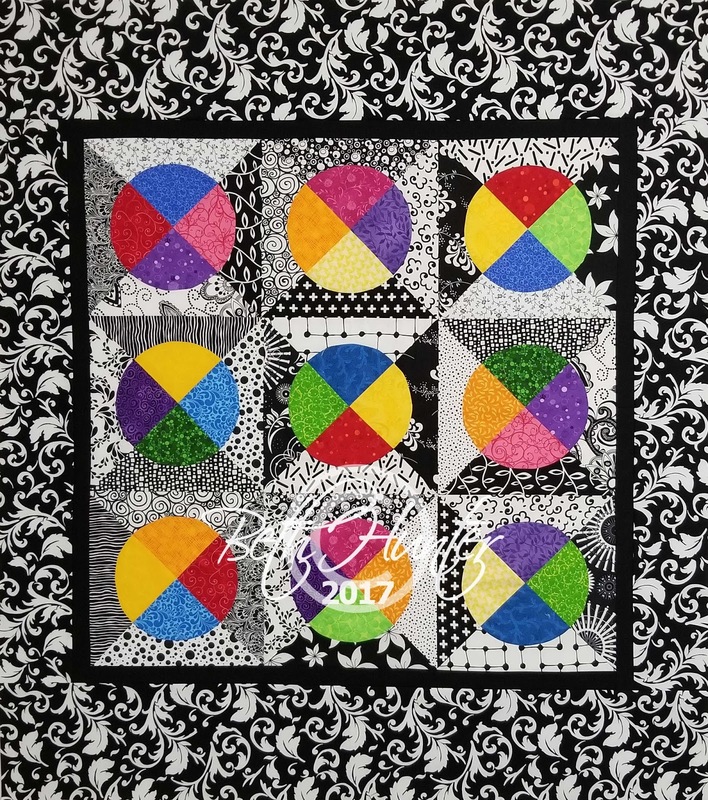 I try to keep all the black, white and bright stuff together and in the box I also found some quarter blocks I started in Virginia (before spring of 2015!) and a stack of leftover Disappearing 9 -Patch blocks. Now fair warning these may make your eyes hurt... 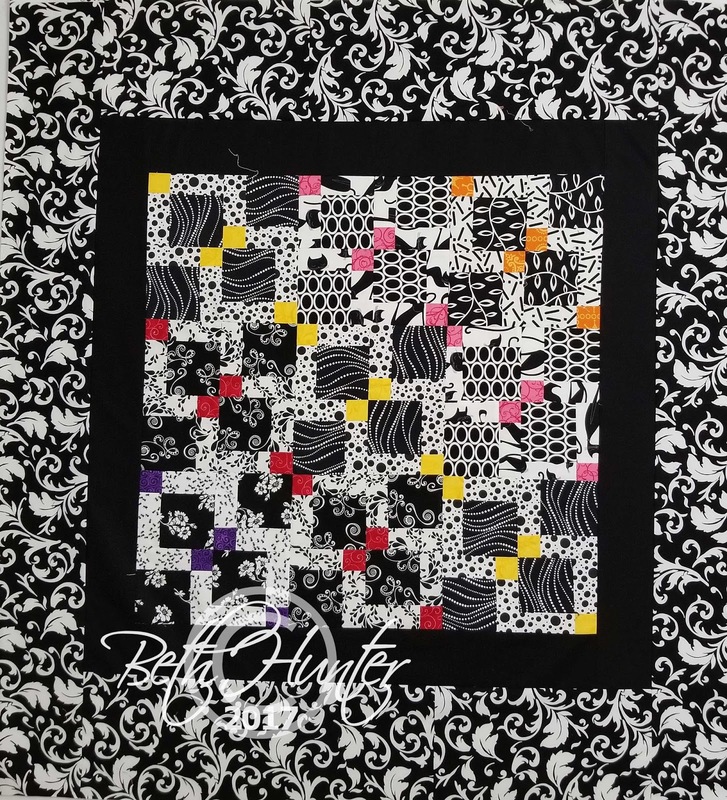 I generally make black and white quilts for babies these days, because their brains are still forming and connections are still being made.... and this colorway is very stimulating. So without further warning... bright is next. 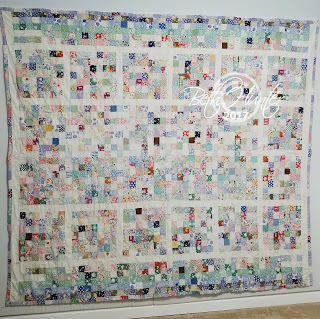 Baby Quilt for Baby D! Baby Quilt for Baby N! I plan to quilt them on the Longarm with a flannel back for warmth and softness, and that will be next week????? What are you creating.... this week. I think we should talk about tools. Not the workbench kind, but the type that help us ‘craft’ better. I have often taken something I heard to heart and continue along my merry way, only to discover that it is or was an old wives tale, the information was based on a completely false interpretation of information or that technology has improved so much the past information or beliefs have been made obsolete. Let’s take needles for instance, technology has made so many changes and advancements that they are almost new again. There was a time…. When Singer was the ‘standard to meet or beat’ when it came to sewing machines, and then in the 70’s Bernina came to the fore… and depending on your favorite machine, may still be for you. But it doesn’t matter which machine you choose to use, if you are not using a -pick one- “good” “correct” “right” “sharp” needle for your project; your machine stitches will not be great! Depending on what you are sewing you may need a specialty needle and there are plenty of those out there, but I think we need to start at the beginning with what I call my “daily driver”… the needle most often found in my machine. But before we get specific, maybe a little needle anatomy should come first. The Shank –the part that fits up into your machine, if you are using a domestic sewing machine it will have a flat side, that most often placed in the machine with the flat side at the back to make fitting and centering the needle fool-proof. If you are using a longarm or industrial sewing machine the shank is round and you have to center the eye of the needle visually. In all machines the needle should be inserted all the way in/up and well tightened, (but not ‘man’ tight). The Shaft of the needle, which is between the Shank and ‘eye’ and has the Groove, that runs up and down on the front of the needle. The groove helps guide the thread from the machine to the eye of the needle to make a stitch. Sometimes specialty threads need a larger groove to flow freely and without difficulty. This is also the area that determines the size of the hole the needle leaves behind. 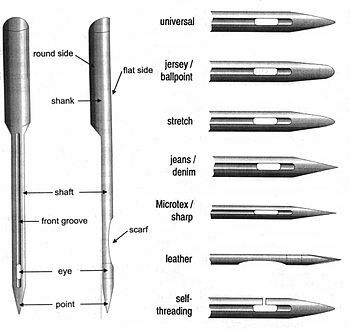 The size of a needle is also important, as it makes the hole and carries the thread through the fabric. A rule of thumb for needle size, the bigger the number the bigger the needle 100/16 is a big needle and will make a big hole, the 70/10 is much finer. A note about the numbers the smaller number is the US needle size and the larger number is the European size, which number is listed first is not important. I am pointing it out, also plays a huge role in thread progression from spool to stitch. Too small and it will shred or break the thread, causing headaches and frustration especially with some of the specialty threads. 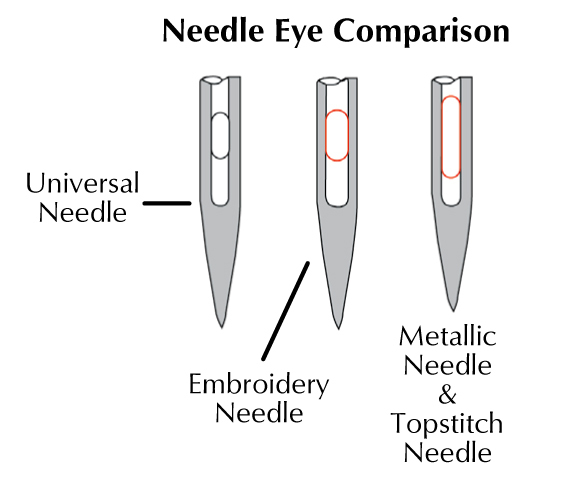 There are several needles that are the same circumference as any other, but the “eye” is where the difference is. 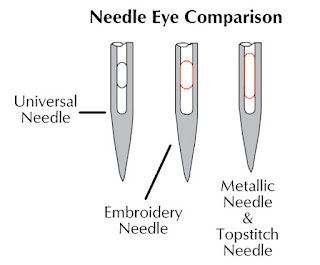 The Topstitch needle eye is larger to accommodate larger threads, an Embroidery needle has an extra-large eye to help keep thread from shredding and a Metallic needle often has a Teflon coating to help the metallic threads move through the eye. Basically if the eye is too small the thread will have a difficult time moving through the eye smoothly, causing all kinds of problems. Lastly the point of the needle, it is the part that pierces the fabric and carries the needle all the way through so that the needle can make a stitch. Too big and it may leave a large hole, too flat as in a ballpoint it may pull threads in the fabric… or a dull needle can also cause very similar difficulties. 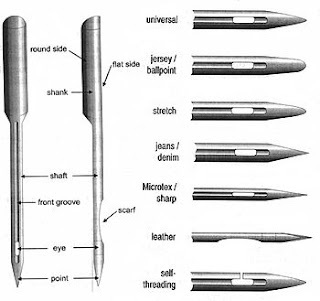 For a long while the Universal Needle was recommended, since the point was sharp for woven fabrics but not too pointy for knits or stretchy type fabrics and is generally a considered an all-purpose needle. 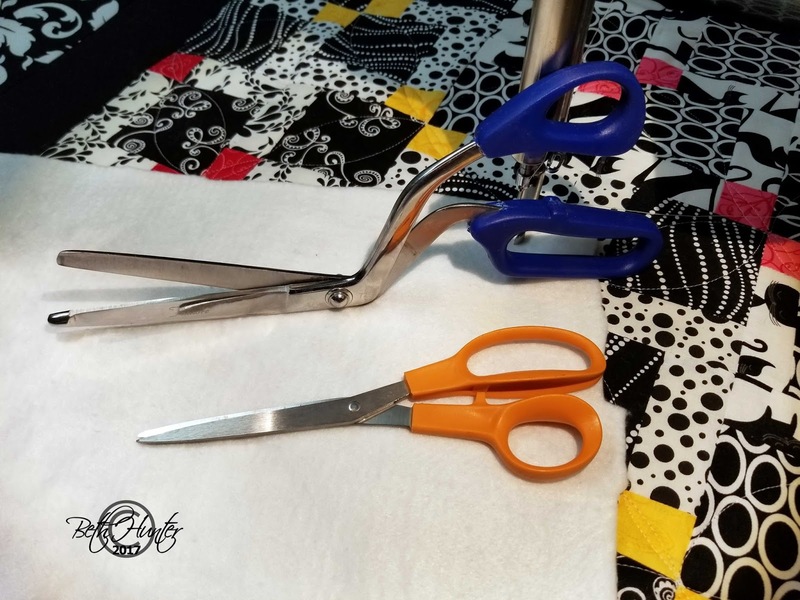 These days for most of the thread use in the quilt making process a Sharp is most often recommended, it pierces the fabric layers easily and carries the thread through a well-made hole. Another aspect that has changed the needle is technology. We used to only be able to get a hardened steel needle coated in chrome. When they come out of the package they are bright shiny and sharp, but after about 8 hours of stitching the point starts to dull and is recommended to be changed. But now we have Titanium coated needles, (which does make them a bit stronger), but more importantly it helps protect the point and does a much better job of dissipating the heat we may generate when stitching fast. The strength it gives the point allows you to sew with the same needle up to t3 to 5 times longer than a chrome plated needle, it is smoother and is cooler to the touch after sewing. Which when you compare the cost is a much better value! So what needle can you find in my machine most days? The Titanium Topstitch 80/12 or 90/14 for general sewing. I have found that the longer life of Titanium needle make them my go to needle for all sewing, whether Free Motion Quilting, Free Motion Embroidery, Decorative Stitches or general piecing or seaming, especially when combined with many of the newer specialty threads. What is your favorite needle and why? Once again .... its a Time thing. What gets done and what doesn't is often less of a choice than there just isn't any more minutes in the day!!! Do you ever run into that? I had a great time in Paducah and had my first opportunity to explore the town since moving to Kentucky. Paducah was supposed to be our move destination in Kentucky, but for some reason we couldn't find a house that would work for us. Oh well, we're close. While in Paducah I stumbled upon a quilt auction and brought home a quilt. Old and a bit worn, each piece was stitched with 1/8 in seams, so some weren't holding together very well. It is a bit brighter than the larger picture shows, as you can see but the photo above. I discovered that the batting was a threadbare blanket. Someone had at one time attempted to make some repairs and I continued with just enough stitches to hold the bits together, long enough to longarm it all together. It was also tied, so once loaded, I snipped the ties. The quilting I added was nothing special, I only paid $12 for the quilt and I had planned to use it as a table cover.... I love the 30's prints and that green that says vintage quilt... The other table has one of my other fun finds... some flower basket blocks that I pulled together for a longarm practice quilt. But I have another vintage Grandmothers Flower Garden planned for larger booth needs. 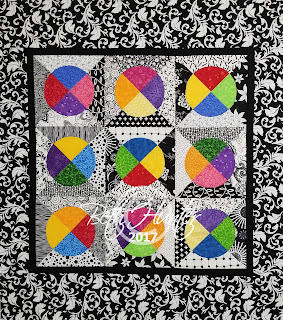 I think quilty things always look great with quilts on the table. Yeah I know not too exciting and quite frankly I am looking forward to some quiet... time hanging around the house and not doing too much for a few days! HA!!! I'm going to keep dreaming.